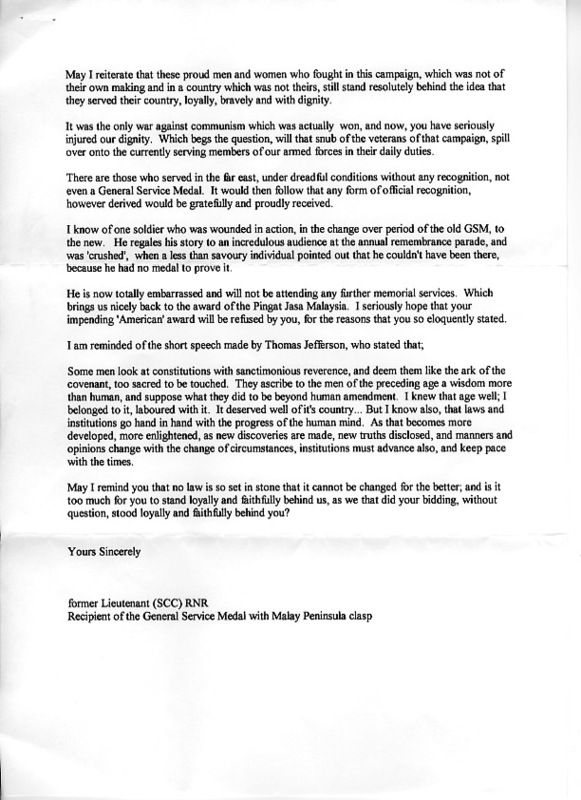 This letter from Dr Arthur Rambart-Spicer doesn't take any prisoners. In our view, it is one of the best expositions of the mean-spirited and misguided recomemndation that we have read. It is printed here with Dr Arthur Rambart-Spicer's permission. This letter will provide supporters with many ideas for their own letters! 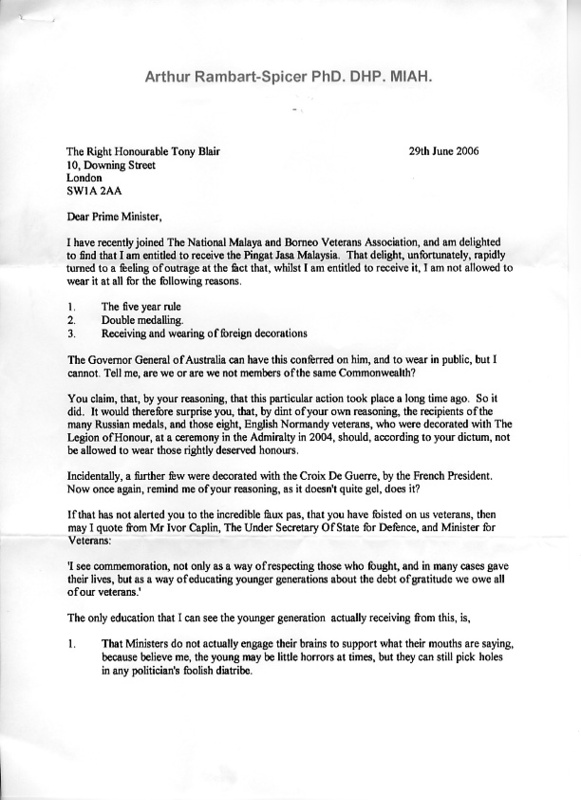 Barry....that letter is the absolute pinnacle!....It MUST be as widely disseminated as possible...I just hope that Tony Blair actually gets the chance to read and digest it....what a piece of work!!!
" I know of one soldier who was wounded in action, in the change over period of the old GSM, to the new. He regales his story to an incredulous audience at the annual remembrance parade, and was 'crushed', when a less than savoury individual pointed out that he couldn't have been there, because he had no medal to prove it. He is now totally embarrassed and will not be attending any further memorial services." How can HMG and these civil servants continue to pretend that they have a tenable case for denying men like this a wearable medal? What is at stake for them at the MOD and Foreign Officew and HD Committee - what are they hiding? I believe they should be made to quantify the loss to this country if veterans are allowed to wear the PJM. 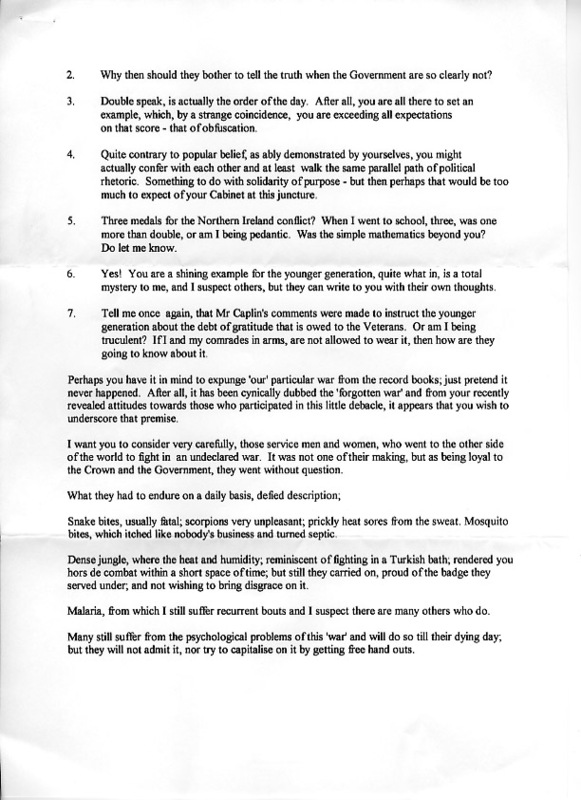 Message: What a marvellous letter from Arthur Rambart-Spicer to Tony Blair. So true and to the point, and I hope if Blair does read it himself he will feel some shame about how he has acted and will not have the courage to accept any medal from America, but knowing the way he is, this will just be water off a ducks back. We will be wearing them regardless!! !